Sulaiman Abu Ghaith is a member of the world's most famous terrorist organization, Al Qaeda. He's also the son-in-law of Osama bin Laden and helped plan the 9/11 attacks. Since the U.S. government is now issuing awards to anti-Semitic, anti-American Muslims who want to see America burn, perhaps Sulaiman is being flown to the U.S. to receive an International Men of Courage Award. 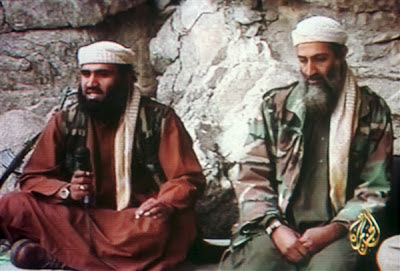 WASHINGTON — Osama bin Laden's spokesman and son-in-law has been captured by the United States, officials said Thursday, in what a senior congressman called a "very significant victory" in the ongoing fight against al-Qaida. Abu Ghaith's extradition to the United States is imminent, and he is expected to be prosecuted in federal court in New York, according to a law enforcement official who spoke on condition of anonymity because he was not authorized to release the information. Rep. Peter King, the former chairman of the House Homeland Security Committee, credited the CIA and FBI with catching al-Qaida propagandist Sulaiman Abu Ghaith in Jordan within the last week. He said the capture was confirmed to him by U.S. law enforcement officials. A Jordanian security official confirmed that al-Ghaith was handed over last week to U.S. law enforcement officials under both nations' extradition treaty. He declined to disclose other details and spoke on condition of anonymity because of the sensitivity of the matter. "Definitely, one by one, we are getting the top echelons of al-Qaida," said King, R-N.Y. "I give the (Obama) administration credit for this: it's steady and it's unrelenting and it's very successful." Abu Ghaith became an international name in late 2001 when he appeared on pan-Arab satellite television urging Muslims everywhere to fight the United States and warning of more attacks similar to those of Sept. 11. In one video, he was sitting with bin Laden in front of a rock face in Afghanistan. A teacher and mosque preacher in Kuwait, he was stripped of his Kuwaiti citizenship after 9/11.